This is the same map with added art (and corresponding links) as the 1 mile hex map was made For Giulio Coroletti for his Article on Carytion Mystara for the Threshold Magazine. I thank the other artists for the pictures I found. As no names could be retrieved I've added the source links to credit them. I also like to rhank Giulio Caroletti for the Initial map and ideas to build this map upon. Giulio, with letting me make this map, you've helped me through a very very depressing period ..therefor my greatest gratitude and thanx. Acqua Bianca Bollente; boiling white water. A violent geological area known in the Rel World Devils triangle where the water suddenly turns white and sinks ships, this due natural chemical released once a while below. The picture I used is of that effect. A very interesting effect, and a logical reason for ships NOT to traverse the region and displace the shipping lane further East." Fort Menech; old Taymoran fort later abandoned. Dragon; U Enigmistama young Onyx dragon, a prankster, a slightly darker twist but in the end he might still be a joker (and the "mysterious" name might be a joke itself). Magic Locations (stars); Illusions are strengtghened in effect, and duration, and decreased in chance to recognize them as such. (near the dragon), SW of Nuguro a non magic area (here all magic is suppressed 100% until it leaves the area. spells are thus dispelled, as are other temporary or direct effects, but magic items regain their powers 24 hours after leaving the area. (artifacts in 5- magical bnus hours). and in the Collina Arba, there is a gate of some kind, that opens on specific dates or circimstances, leading to....who knows what." (this is to the DM to decide; but dates related to the carytionids, history might suit best. it could thus be a temporal gate, leading to that time period, where the heroes could become part of history, (maybe even as the important figures), without altering it . Crystals; The Crystal Coast ---> Costa Cristalla is an interesting region, as it softly sings melodic tunes, nor real music, but a sort of palladium of soft tingling sound. based on his. vignette2.wikia.nocookie.net/rappelz/images/c/c3/Pic_-_Rondo_Area_-_Crystal_Coast.png/revision/latest?cb=20110814215759 these crystals shed an eerie pinkish ligh at night, recharge at day. effects. unknown as of yet. The crystals can be harvested succesfully in Autumn when of fullgrow size (3 to 5 feet) and can be used to make magical musical instruments. (the effect increases the creation of such an item wit 50% and doubles duration of ane magical sonic effect. imposed from it. It will regrow each year, Winter seems to "kill" these crystals till they break from their underground roots, thus losing effect. (except as decoration or other nonmagical usage)." Monsters; Actaeon. (sort of Elk Centaur) near mount Curiosa. Originally a forest creature but sort of forced here in the Hilled bushes due to encroaching humans. 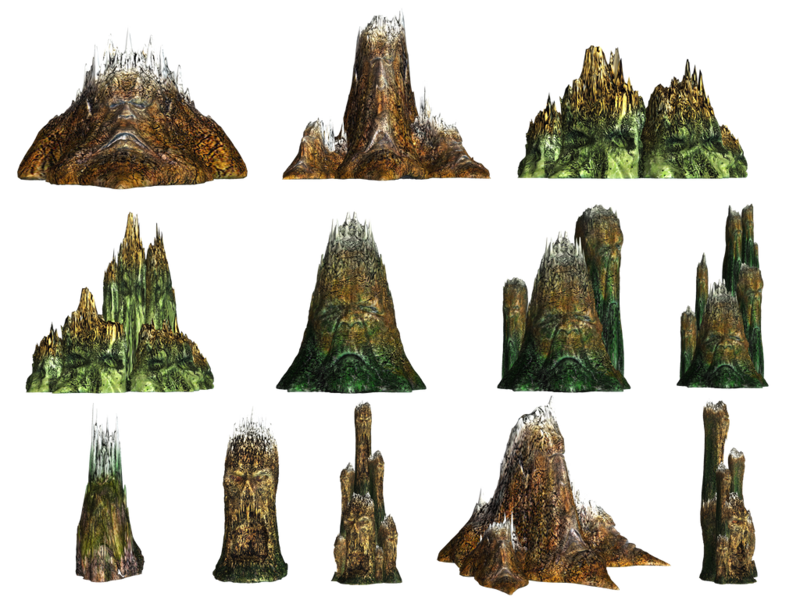 Ruins; Fomorian Giants preferred hils to reside (probably due their genetic origin from Hill Giants, so the ruins with orage dots are Fomorian. Scogliere delle Navi Perdute'; holds several vessels that are still visible in low tides. The sunk pirate vessel being the most interesting, being even visible at high tide. it crashed on these reefs in a freak storm, but the locals say a local witch (the crone of chaos??) caused the pirates to crash when they tried to leave with their stolen virtues and wealth. As thus some strange secrets might be able to be ffound in the wrekage, probably guarded by the undead cursed crew. The locals stay away from this haunted spot, but sometimes a cursed soul ventures within the swamp, binding other to his cused cause. The scoglieri sulci together with the other cliffs force the vessels towards Casteddu bay. As such, the statue symbol, along the rocks there, is a large partially destroyed by time Fomorian Ruler of long ago....it (and the other ruins) might hide clues, however, to discover Fomorian History. The many caves on the Southern coast go inwards for hundreds of feet and are caused by tidal erosion in the sof rock (Chalk) some could be used for smuggling, secret hideouts, a hidden monster etc. where you can find the link to download the issue. Thanks to all the authors, editors and proofreaders for the great work done in producing another beautiful issue of Threshold! Giulio Caroletti made a very interesting article for the upcomin Threshold magazine. It is the Island East of Thyatis on Mystara. it will be issue 11 as far as i know. that will become available soon... they are working on the final steps now. I will add a direct link as soon as available. time zone, zodiac, and weather patterns?? These can be found on the Trail maps and within the Poor Wizard Almanacs. Yeah. We had talked about it all at one point.